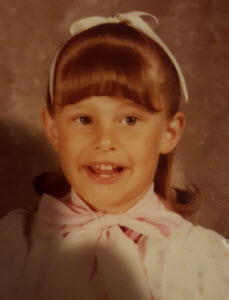 Proper Tongue Posture & Face Positioning; How Should Your Tongue Rest in Your Mouth to Not Cause Crooked, Crowded Teeth? Did you know that the look of your face and the spacing or crowding of your teeth could have a lot to do with the way you swallow and rest your tongue and jaw? We are talking about your facial posture. Many people assume you look the way that you do due to genetics and that is a huge part of it. But some of the subtleties and issues with your teeth have to do with your facial and tongue posture. If you think about it, most babies look very similar but as they start to grow and learn to walk, crawl, talk and eat; they are shaping your body. That is when they start to look different and individualized. Facial meltdown is a term used to describe the changes that take place in your looks due to bad tongue and facial postures. Most of the time these problems present themselves as crooked and crowded teeth or poorly developed airways. By the time a child has lost their baby teeth and grown in adult teeth, these issues may become more apparent. They could require intervention by an orthodontist to correct the problem. A better solution is to know what facial posture is and what the optimal posture should be so that you can help your family and children before it becomes a problem. The first step is to be sure that your child’s teeth are well taken care of by a regular dental exam and cleaning at a trusted pediatric dentist’s office. Smile Reef has a list of facial and tongue postures you can check with your children to make sure they are following good oral positioning habits. How Do You Swallow? This is a big deal when it comes to the spacing and shape of your jaw and teeth. When you swallow food or a beverage, you should be able to do it in a very relaxed state. You should never be straining to do this and if you are, you could be heading towards damage to your teeth. To check if you are swallowing correctly you can place a finger on your chin and swallow. Did your muscles tighten? Did your chin move forward or back? If not, then you got it right! Where Should Your Tongue Rest When Your Mouth is Closed? Your tongue is a giant muscle that is able to manipulate and move your teeth if given the chance. Your tongue has the ability to shift your teeth or bite and make it necessary to have some kind of corrective procedure. The best place for your tongue to rest is at the roof of your mouth and about a half inch away from your top teeth. You do not want it pushing on your teeth even in the slightest. Does Your Mouth Hang Open a Lot? When you have stopped eating and are not talking to anyone, are you lips apart or sealed together? For optimal facial posture you want to have your lips closed for all other activities. Even if you are working out you want to use your nose to breathe not have your mouth open. This can lead to your face looking like it is droopy and will over time adjust your bite to either an underbite. 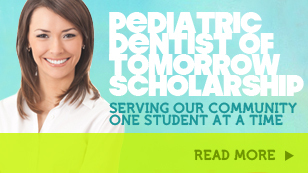 Smile Reef offers expert dental care for children in the Las Vegas Nevada area. Give us a call today to schedule your next appointment. Getting children to the dentist can be a difficult task. More often than not, children can be fearful, stressed, anxious or a combination of the three when it comes to going to see the dentist. As a result, more and more parents are not pushing their young ones to see a dentist until most of their adult teeth have come in, or there is a dire need. But taking your little ones to the pediatric dentist at an early age can be quite beneficial in a multitude of ways. Smile Reef would like to relate the benefits and advantages to getting your children started on having routine maintenance pediatric dental visits. 1. Dentists who specialize in pediatric dentistry undergo extensive and additional training to gain the credentials to become a pediatric dentist. After the general four years of study to become a dentist, a pediatric dentist then has to complete two years residency training. Their practice includes infants, toddlers, children, teens and children with special needs. Getting a pediatric dentist for your children means getting the expertise that comes with it. 2. Being a pediatric dentist means working with children of all ages and with many unique and special circumstances day in and day out. Get involved with your young ones dental care with comfort and patience. Performing exams and procedures is second to making the child feel at ease and unafraid. 3. Pediatric dentists not only have knowledge and talent to care for the children’s oral hygiene, but can often catch any problems early on before they become serious issues. Preventative care, cavities, tooth defect repairs, gum diseases or any other similar oral care they may need will be treated efficiently. Along with early diagnosis or simple maintenance care, if your child feels comfortable with a dentist early in life, they will not develop the fears often associated with going to a dentist. 4. In comparison to a family dentist office, the pediatric dentist is more kid friendly. Often decorated in children themes and having toys and other such commodities available, kids feel more at ease in an office that appeal more to them. With that also comes children in and out, making the more weary child a little more calm when seeing other children in the environment. 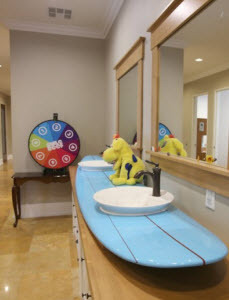 At Smile Reef, we have a beach themed office that children love! 5. Most pediatric dentists offer sedation dentistry as well. For children prone to anxiety or with special needs, taking advantage of the sedation dentistry service can help children get the dental care they need without the negative emotions that might overwhelm them. At Smile Reef, our professionals know that children require special attention. Working with children, and performing oral care and treatments for them is a passion. Ensuring they are comfortable and relaxed is our priority. We utilize modern technological advances and procedures to achieve healthy smiles and still maintain affordable treatments. When looking for the right dentist for your children, you have come to the right place. They will receive professional quality dentistry and enjoy their surroundings. Call us today for your appointment!